The poor have long known that a budget cut passed in Congress means hardship in real life. Now middle-class Americans realize that, too. As thousands of air travelers suffered through flight delays last week, the average American got a lesson in civics: when you cut government spending, it has real life consequences. Americans are fond of saying that they want to slash government spending in the abstract, but loath to point to specific programs that they actually want to cut. With sequestration, this ambivalence has come home to roost. Because the automatic spending cuts known as sequestration affect all programs evenly, the ones that touch middle-class Americans, not just the poor, have suffered equally. We haven’t just learned a lesson about the effects of budget cutting, though. We’ve also been able to see the priorities of Congress in stark relief. 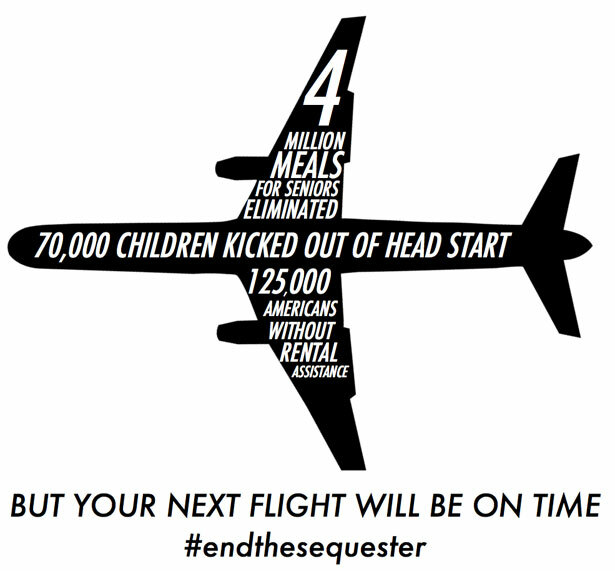 The flight delays, a result of furloughs at the Federal Aviation Administration, were not the first effects of sequestration. Those were visited on the poor. Yet the FAA was the only agency that saw swift and bipartisan action. After Congress was flooded with calls from angry travelers—not to mention, as lawmakers started down flight delays for their own flights home for recess—the Senate and House each passed a bill with overwhelming support within forty-eight hours. When’s the last time you remember that happening for any other issue? The poor have long known that a budget cut passed in Congress means hardship in real life. This dynamic was in full force as sequestration went into effect. The first to be hit by the reduction in funds, by and large, were low-income Americans. Preschoolers have been kicked out of Head Start. Food pantries have closed. Native American health services have been reduced. Thousands of cancer patients on Medicare have been turned away from clinics. Meals on Wheels is delivering to fewer elderly people. The long-term unemployed will receive severely reduced benefit checks. While these cuts have been well covered by local media, the rest of us haven’t heard much about them. Yet when furloughs delayed flights, they dominated the media, as did the cancellation of White House tours. In mainstream cable news coverage, flights were mentioned about two and a half times more than Head Start, over twice as much as cancer patients, and six and a half times more than Meals on Wheels. White House tours were even worse: they were mentioned thirty-three times as often as the sequester’s impact on the poor. The coverage of tours and flights was likely driven by something we don’t see very often: budget cuts that impact nearly all Americans. Targeted cuts tend to focus on programs that the poor rely on, and we rarely hear those stories. But even middle-class and well-to-do Americans were feeling what it’s like to have reduced government spending in their daily lives when they went to the airport and waited an extra hour to take off. This is surely a mere inconvenience compared to losing food or housing if you’re poor, but it’s still important: Americans of all income levels may finally be learning the importance of government spending in their lives. For this reason, perhaps, well-off Americans tend to be less concerned with spending on the social safety net and more interested in cutting government spending. This has huge consequences for our political system. A body of research has shown that the needs and desires of the poor rarely influence how their representatives vote. On the other hand, Congress’s priorities nearly duplicate those of the wealthy. And here is the last lesson sequestration has taught us: just how much more Congress cares about what’s bothering upper-middle-class citizens than what’s going on at the bottom of the income scale. There are tons of different programs expecting a big impact from sequestration. None of them saw multiple bills introduced in the Senate, one of which was passed with huge support on both sides of the aisle and signed within a matter of days. Had they continued, the furloughs would have been more than an inconvenience. They could have meant sharply reduced economic output. But the same could be said of many of the cuts to other programs. The lesson is not that the flight delays should have gone unaddressed. It’s that if a budget cut doesn’t impact a wealthy constituency, Congress can’t to be bothered to fix it. What can America learn from Australia about abortion access? Read Chloe Angyal’s take.